*Originally published on CIRCA Art Magazine as part of the ‘Degree Shows : Writers’ series. View full series online here. Edited by Michaële Cutaya and Chris Hayes. There really is something about Anna Gormley’s canvases! They perform at their best in the flesh, yet still managed to intrigue online when shared on the year group’s Instagram feed in the build up to her degree show. I visited the show with a friend who also admitted to having taken notice of the work somewhere on social media before our visit, and likewise had her curiosity aroused by what she saw. The luring charm of Gormley’s work comes quite unexpectedly. She shows three generous sized paintings in her exhibit, all portraits and conjured up through expressionist vocabulary and mannerisms. These three vigorously painted and distorted heads with swells of oil paint have flesh pink and red enough to burst. They foreground themselves on backgrounds full of feral marks, drips, smears and colour combinations. In the tall, upright diptych The feel of plastic the blood drains to the top of an upside-down head, floating on a clashing blue and yellow stained backdrop. In the largest painting Temporal Possessions, the face of the figure sitting atop of its shoulders with gesturing hands is described and stretched through multiple viewpoints. In the last work Pulse the subject is painted slashed or cracked down the middle between their eyes, and one can just about make out, amongst a flurry of marks, another ambiguous hand gesture. None of this stuff suggests charming. Lashings of colour, marks, paint and blood filled heads about to pop would suggest these traditionally bold and exuberant works might be off-putting or ugly. But there is something in their making that makes them seductive, absorbing and they linger in your thoughts. Perhaps it is because she pushes her images deep into a territory where they should in all probability fail, but just about holds them together, creating really distinctive intrigue in the process. Not a new idea, but much easier said than done. Still! these paintings feel current. In proposing “the role of the heroic male genius painter is subverted”, Anna Gormley makes reference and contributes to one of the dominant threads really visible in this year’s LSAD painting department degree shows. There is an abundance of figure painting, and in particular figure painting that directly and explicitly addresses really present cultural debate and critique relating to gender objectification, identity or power structures. 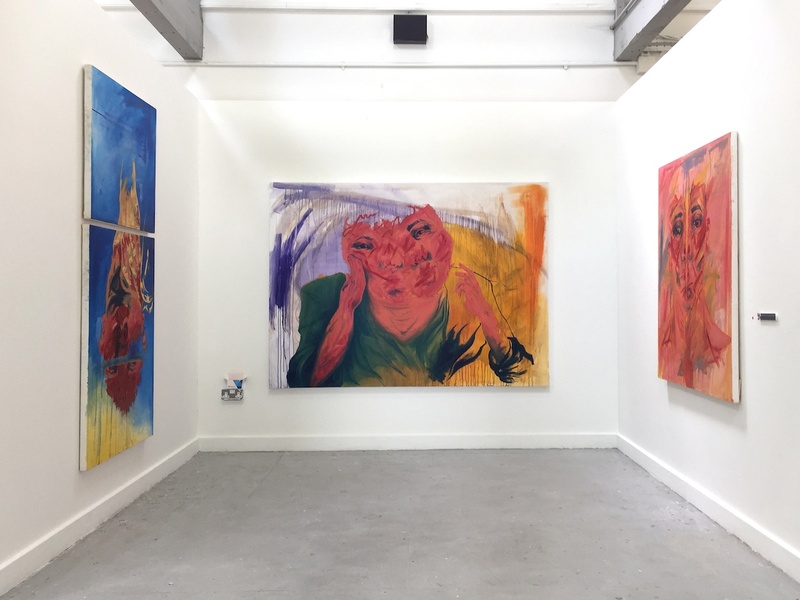 In different ways, and with some really interesting moments, the degree shows of Úna Cahill, Gemma Cowen, Lauren Egan, Evie McGrath and Róisín O’Sullivan reflect on those themes. Along with Gormley, through figure painting they are making work born straight out of the experience and discourses of the here and now.